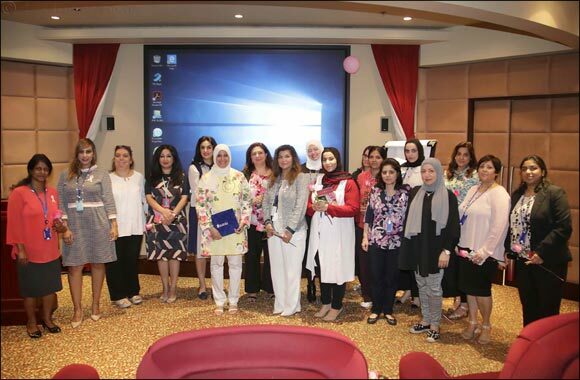 Kuwait – 20 October 2018: As one of the leading contributors to community development and a pioneer in supporting healthy lifestyles, Burgan Bank recently hosted its yearly breast cancer awareness campaign dedicated to the betterment of its staff. Titled “Together against Breast Cancer,” the bank organized an educational workshop aimed to stress the importance of healthier nutrition, regular exercise, and raise awareness about symptoms, causes, risk factors, treatment, types, and prevention methods. The workshop brought to light one of the most concerning health risks plaguing the country wherein, an alarming increase of cases have been reported both locally and internationally. This year’s session was led by Dr. Noha Al-Saleh, Consultant of General Surgery and Surgical Oncology at Royal Hayat hospital. Backed by 10 years of first-hand experience at the Kuwait Cancer Control Centre, Dr. Al-Saleh brings a wealth of expertise in screening tests for breast and colon cancers, diagnosis, and treatment using the most advanced methods. The renowned doctor held an interactive lecture and Q&A session on the effects of the psychological state of cancer patients, ways to deal with the stress and how to overcome the potential challenges or cancer-related diseases by maintaining a healthy diet and lifestyle. Burgan Bank aimed to create a supportive internal environment, where staff can join hands and fight a common issue together. Burgan Bank has been a strong advocate of breast cancer prevention for several decades. Observed every year, these efforts are driven by the belief that through awareness-raising, positive reinforcement and credible role models, employees can achieve better health, ultimately building stronger families, organizations, and communities. Bank’s approach to 'ENGAGE' begins with a vital principle that as a leading Kuwaiti financial institution, its conduct and policies should be aligned with the needs and interests of the community.